Marching band is something that many see, but glance over. They may enjoy the loud music and colorful flags, but the experience is over as soon as the performance ends. 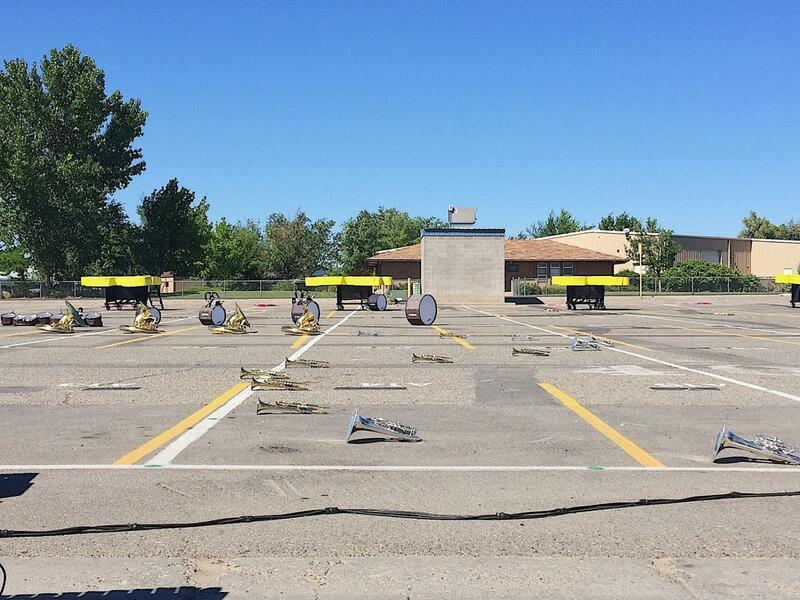 But for over 100 people involved in the Fruita Monument High School Wildcat Marching Band, it’s so much more. The marching band season starts in late July and finishes in late October. The members have 2 hours and 15 minutes of rehearsal every day, plus 8 hours nearly every Saturday. All of these hours accumulate into an eight minute show. The members are working in August during the hottest parts of the day, when the temperature exceeds 100 degrees in Fruita. On these days, the temperature reaches scaldingly hot on the pavement they spend hours marching on. They work on the coldest of days, bringing gloves and hats for when the air drops below freezing and they can see their breath come out the end of their instrument. There’s something special about the hard work of band members, or it may just be their passion for this art. Somewhere along this wild ride of a season, there becomes a connection between the individual member and the band itself, and band takes on a life of its own in their heart. The connections between the members of the band and everyone else involved is what makes band so special. Between woodwinds, brass, percussion and colorguard there are 11 separate sections that all work together to get all the musical and visual effects to happen at the exact same moment. There are 19 band members who are on the band leadership team, making sure that each section gets all their work in and knows exactly what’s going on. Even beyond the band members itself, there are many pieces that all work together to make the band what it is. Out on the field, there are 18 volunteers who sacrifice their time to move puzzle piece props around during the show. There are also the band parents, who spend their time manning the food tents during band camp and helping out during state competitions. State competitions, held in late October at the Colorado Springs Air Academy, are when people connect to the band the most. Spending four days among marching band is one of the best experiences for a dedicated marcher. Kaylee says that her favorite part of the State Competitions is an annual tradition called the Paper Plate Awards. “At the end of the season, someone may feel like they’re kind of under the radar, but then you get this paper plate award. Though it’s just a paper plate, the words on top of it can mean so much. It’s just like, ‘Hey, we probably don’t talk very much, but I see you. I notice you. I’ve noticed you throughout this whole season. I’ve seen you doing this one thing; thank you for this one thing.’” It’s a true moment when everyone in the band feels connected even when they didn’t know they were. Marching band is like a puzzle. There are many different pieces and missing only one can ruin the whole picture. Without the hardwork and dedication of every member of the band, there would be no way any of the pieces would fit together. Without the connections between every member of the band, the picture wouldn’t be able to form. With three months and dozen of hours, (not to mention hard work from every single piece) all the pieces come together to form one beautiful picture. The connections between the music and every member, between every member and their sections, between the sections and the band, between the band and the community, and an infinite amount of more connections is what makes marching band what it is.